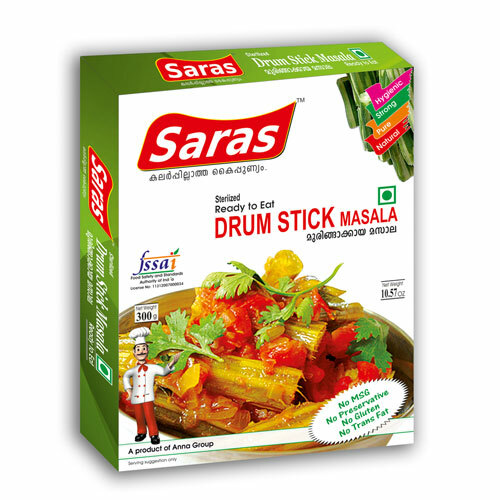 Masala is a common homely name in India for any special mix of spices made for each dish.Indian Masalas are known for its unique taste and flavour.. Saras Drumstick masala is specially made for preparing an authentic dry drumstic masala.It can go with some other similar vegetable also but its aptly suitable for The product is passed through a strict quality control conforming to International standards.Saras ensures high quality in all the ingredients used in all their products. All these masalas are made medium spicy to match any kitchen. India is popular for its different kinds of Biriyanis. Though looks as a simple rice dish, its making is complicated if you don’t have a proper recipe and the right masala. 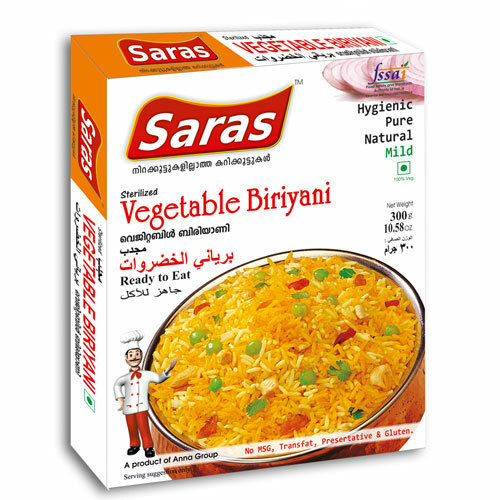 Saras Ready to Eat Vegetable Biriyani is a unique product where you don’t even Cook. All required ingredients are aptly mixed with the best quality Basmati Rice to give a smell and taste like an authentic Indian Biriyani. All that’s required is to snip open the pack, put it in oven, steam it, or keep in boiling water for 5 minutes and it is ready to serve. 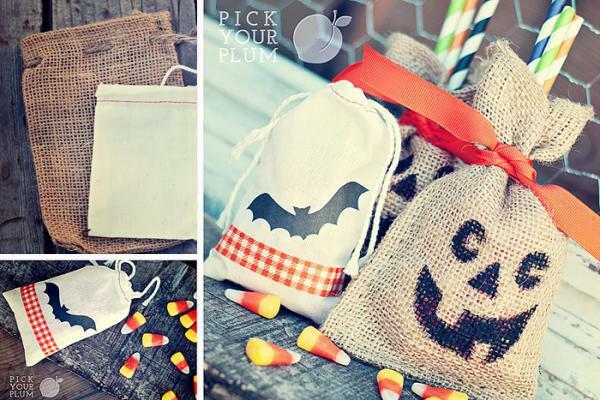 These products do not require any cooking and are useful on any occasions like picnics and late-night dinner parties.This product is free of Trans fat,MSG & Gluten. India is popular for its different kinds of Biriyanis. Though looks as a simple rice dish, its making is complicated if you don’t have a proper recipe and the right masala. 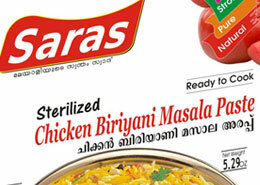 Saras Biriyani Masala Paste is a ready to cook paste for making Chicken biriyani at home. 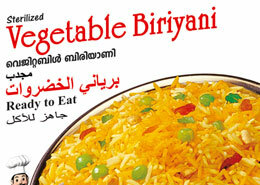 All required ingredients are aptly mixed to give a smell and taste like an authentic Indian Biriyani. This product is free of trans fat. Aromatic & appetizing seasoning is what makes Indian gastronomy stand-out from the rest of the world. But in today’s fast paced world, we lack the adequate time and patience to cook lip-smacking and satisfying cuisines each day. 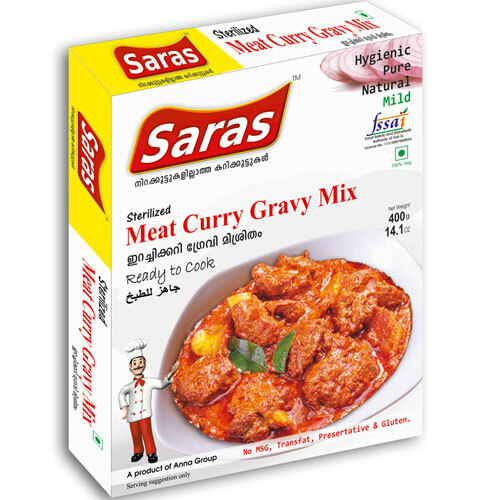 Therefore, in order to save our precious time and labour in the kitchen, and at the same time improve our culinary skills, Saras has launched a new array of Ready to Cook gravies that are ideal for cooking quick, delicious healthier cuisines in a jiffy, without compromising on the taste and aroma of the cuisine. Saras Ready to Cook products are manufactured in state-of-the-art grinding mills and processing plants, to ensure 100% hygiene in quality ingredient selection, process operation, packaging and shipping. Through the process of sterilization, all micro organisms are completely destroyed to prevent microbial spoilage and thus poisoning and re-contamination is totally prevented by packing in air-tight 3 layers metalized retort pouches. All these Ready To Cook products are FSSAI certified, and are manufactured in HACCP certified unit to ensure matchless quality and hygiene.Saras Ready to Cook products have also been approved by Export Promotion Council and Food and Drug Administration of USA. Kerala is known for its regional cuisines and Malabar Fish Curry Gravy Mix is a ready to cook paste reckons to the Northern Kerala style of Fish Cooking. This will be more of a saucy dish as the Northern Kerala people eat this fish curry even as a side dish for breakfast breads. 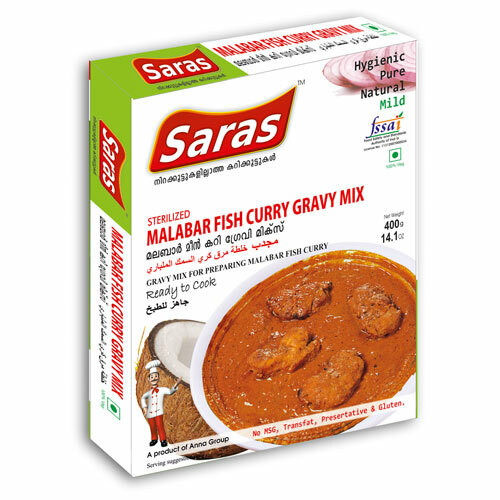 Saras Fish Curry Gravy Mix is a special home made recipe processed in a natural way without any additives to give you a homely flavour. This product is free of trans fat,MSG & Gluten. Aromatic & appetizing seasoning is what makes Indian gastronomy stand-out from the rest of the world. But in today’s fast paced world, we lack the adequate time and patience to cook lip-smacking and satisfying cuisines each day. 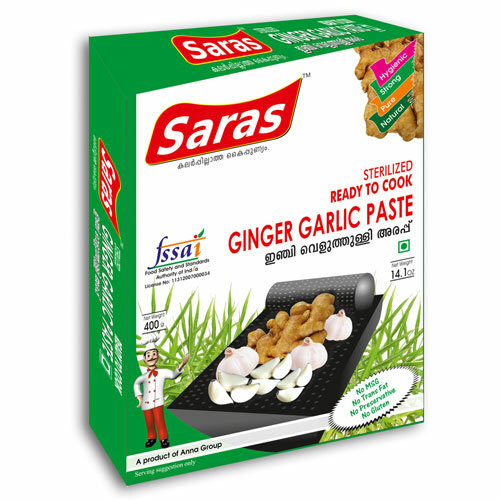 Therefore, in order to save our precious time and labour in the kitchen, and at the same time improve our culinary skills, Saras has launched a new array of Ready to Cook (RTC) gravies that are ideal for cooking quick, delicious healthier cuisines in a jiffy, without compromising on the taste and aroma of the cuisine. Saras Ready to Cook products are manufactured in state-of-the-art grinding mills and processing plants, to ensure 100% hygiene in quality ingredient selection, process operation, packaging and shipping. Through the process of sterilization, all micro organisms are completely destroyed to prevent microbial spoilage and thus poisoning and re-contamination is totally prevented by packing in air-tight 3 layers metalized retort pouches. Saras Ready To Cook products are made using 100% natural and organic ingredients, and no artificial preservatives or chemicals are used. All these Ready To Cook products are FSSAI certified, and are manufactured in HACCP certified unit to ensure matchless quality and hygiene. Saras Ready to Cook products have also been approved by Export Promotion Council and Food and Drug Administration of USA. Ginger & Garlic are inevitable ingredients in most of the Meat Preparartions and some specialities. 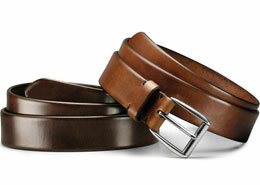 It can be a problem for a beginner cook to prepare a right combination of both these gastronomy kings. 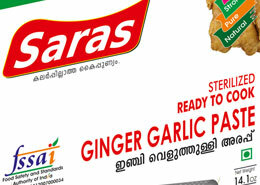 Saras Ginger Garlic Paste is a right combination of both the spices in the right quantity to give you the best of Saras Ginger & Garlic Paste is a pure product hygienically prepared to give the real taste of Fresh Spices. This paste makes your cooking easy as you just need to add the required quantity and cook. As this is a concentrate, it gives you more flavor on small quantity. This paste is free of MSG,Trans fat and Gluten. 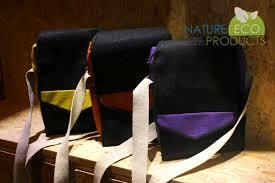 The product is passed through a strict quality control conforming to International standards. 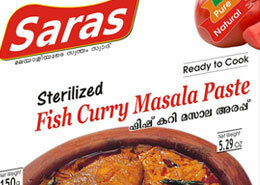 Saras ensures high quality in all the ingredients used in all their products. Pressure cook 500 gm chicken/ meat pieces mixed with 20 gm of Saras Ginger garlic paste and 100 gms of Saras Chicken/ Meat masala powder for 3 to 5 whistles for chicken and 12 whistles for meat for on low flame till the meat is cooked. 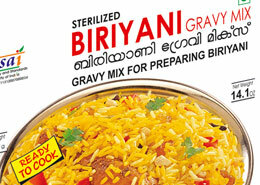 Open cook for few minutes to see and attain the desired gravy consistency is obtained. Garlic plays a major role in gastronomy because of its medicinal value. 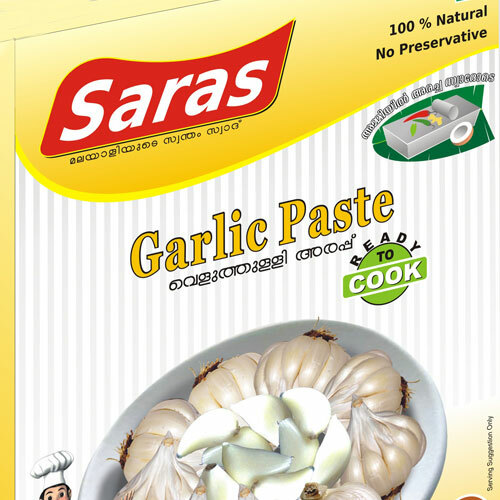 Saras Garlic Paste makes your life easy by bringing a healthy paste evenly grinded and pasted as a ready to use for any cooking. The paste is made out of best quality fresh garlic. 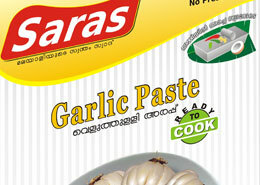 Saras Garlic Paste is a pure product hygienically prepared to give the real taste of Fresh Garlic. This paste makes your cooking easy as you just need to add the required quantity and cook. As this is a concentrate, it gives you more flavor on small quantity. This paste is free of MSG,Trans fat and Gluten. Saute 25 gm each of crushed greenchillies, Saras garlic paste, saras ginger paste, one cup of chopped onion and 50 gm of Saras Chicken masala.Mix the entire items with 1 kg chicken pieces with enough salt. Mix well and cook on low flame. Your savoury chicken curry is ready. Ginger is a common item in any kitchen. But its always a concern to grind it properly to taste good in dishes. 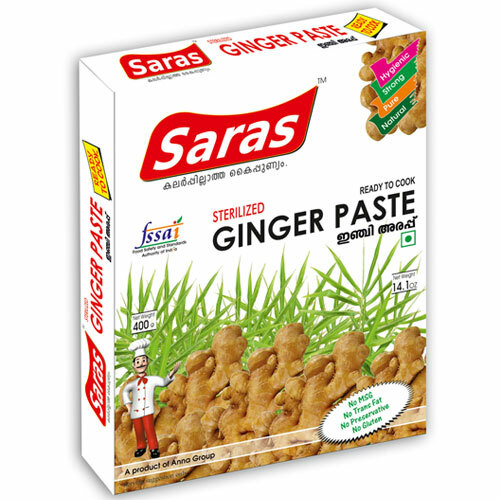 Saras Ginger Paste is a pure product hygienically prepared to give the real taste of Fresh Ginger. 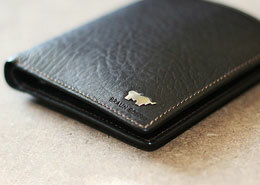 Its grinded to absolute paste without fibers inside. This paste makes your cooking easy as you just need to add the required quantity and cook. As this is a concentrate, it gives you more flavor on small quantity. This paste is free of MSG,Gluten and Trans fat. Heat 40 gm Cooking oil in a pan and add 10 gm Mustard seed,.Keep ready 3 Springs curry leaves, 6 pieces broken chilli, 25 gm Chopped green chilli and 100 gm Saras ginger paste. Once the mustard seed is done,put the above items in the pan and fry well on a low flame. Later add 20 gm Saras coconut varuthara paste (Coconut fried,grinded paste), 30 gm tamarind pulp, 30 gm jiggery (Black raw sugar) and 30 gm salt. Add a dash of asafoetida and cook till the oil comes out.You can use this curry as fresh or use later. Butter chicken though belonged to a certain region in India, because of its tempting taste, it’s a common dish throughout India now. 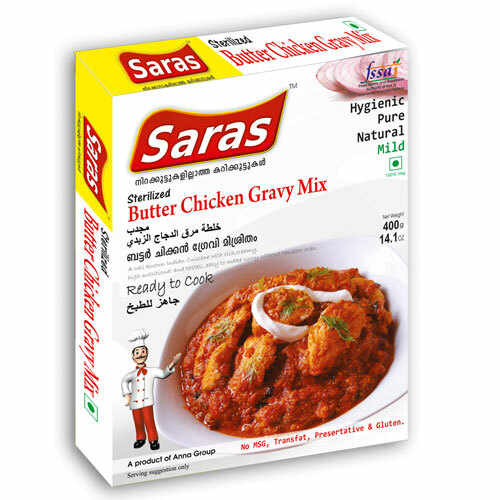 Saras Butter Chicken Gravy Mix is a Ready to Cook paste with a unique formula to give you the real taste of Indian butter in a tasty combination of spices and specialities. This ready mix makes your cooking a unique dish so easy and handy. This product is free of Gluten,MSG and Trans fat. Take 800 gm dressed Chicken cut into medium pieces. You will find a small pouch inside the master packet which contains the masala for marinating the chicken.Marinate chicken with the entire contents of small packet. Keep it for 30 minutes. 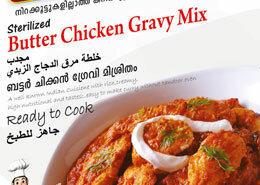 Fry in little oil, add Saras Butter chicken gravy mix in to fried chicken and add 400 ml milk for cream and cook. Garnish with butter. Traditional Kerala (Indian) Fish curry is always a daily talk with anybody tasted the same. 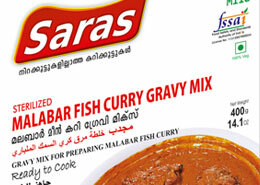 Saras Fish Curry Paste is a unique combination of the essential spices for making a traditional Fish Curry. 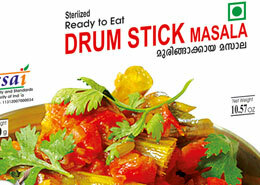 The ingredients are evenly grinded to suit the flavour and saucy .This product is free of trans fat. 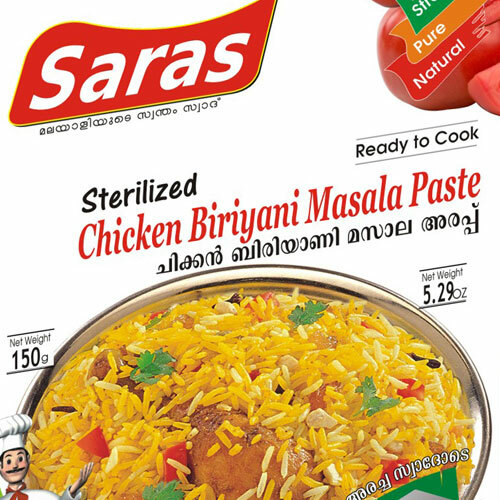 Saras Ready to Cook products are manufactured in state-of-the-art grinding mills and processing plants, to ensure 100% hygiene in quality ingredient selection, process operation, packaging and shipping. Through the process of sterilization, all micro organisms are completely destroyed to prevent microbial spoilage and thus poisoning and re-contamination is totally prevented by packing in air-tight 3 layers metalized retort pouches.Saras Ready To Cook products are made using 100% natural and organic ingredients, and no artificial preservatives or chemicals are used. All these Ready To Cook products are FSSAI certified, and are manufactured in HACCP certified unit to ensure matchless quality and hygiene.Saras Ready to Cook products have also been approved by Export Promotion Council and Food and Drug Administration of USA. Open the packet and mix the entire contents into 350 ml water, 1/2 kg dressed fish.Then cook on low flame until the fish is done.Now your Fish curry is ready to go with your main dish like rice or bread. Meat Curry Paste is a unique combination of all required spices grinded to enable any beginner to cook meat on an easy recipe.It makes your cooking fast and tasty.Its again made on a traditional homely recipe brought over. This product is free of Trans fat. 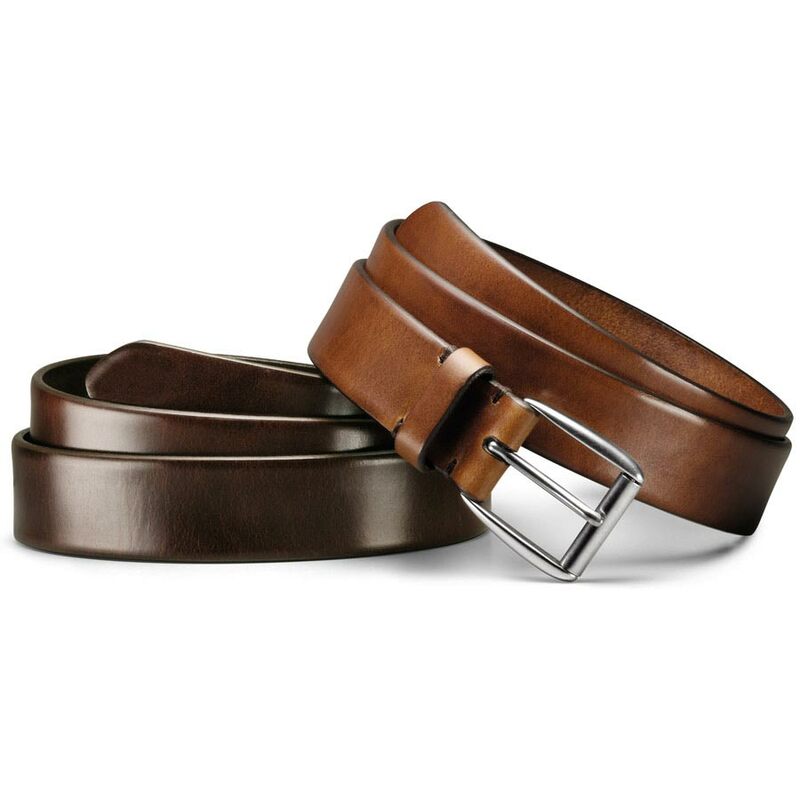 The product is passed through a strict quality control conforming to International standards.Saras ensures high quality in all the ingredients used in all their products. All these masalas are made medium spicy to match any kitchen. Pressure cook 500 gm meat cut into small pieces mixed with the entire contents of Saras Meat curry paste for 6 to 10 whistles on a medium flame till the meat is cooked. Open cook for a few minutes to see and attain the desired gravy consistency obtained. Garnish with coriander leaves and serve hot. Masala is a common homely name in India for any special mix of spices. But the interesting factor in Indian cooking is that there is a special masala mix for each dish which makes Indian cuisine unique and savoury. 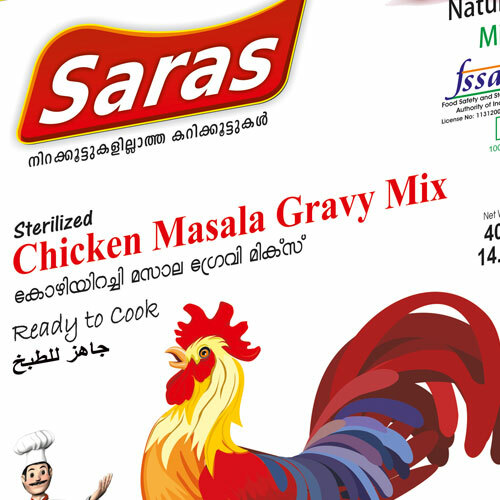 Saras Chicken masala Gravy Mix is a is a special home made ready to cook recipe processed in a natural way without any additives.This product is free of MSG,Trans fat and Gluten. 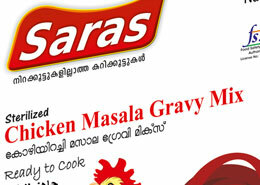 Pressure cook 1 kg dressed medium piece chicken with entire contents of Saras CHICKEN MASALA GRAVY MIX for 3 whistles. Open cook for a few minutes to see and attain the desired gravy consistency. Add a little lime juice for better taste. 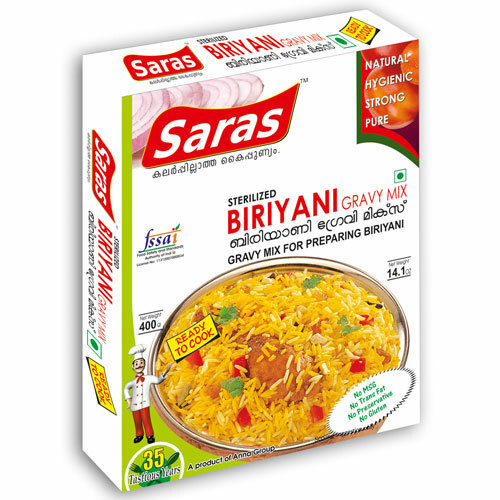 Saras Biriyani Garvy Mix is brought to make you a professional Biriyani Cook in no time.All required ingredients are aptly mixed to give a smell and taste like an authentic Indian Biriyani. This product is free of MSG,Gluten and Trans fat. Preassure cook 1.2 Kg dressed chicken with half the content of Saras BIRIYANI GRAVY MIX for 3 whistles. Open and add rest of the gravy mix and boil till a thick gravy is obtained.Wash and drain 1.2 kg good quality basmathi rice and keep ready for cooking. Take One Cup (200 gm) of Ghee or Vanaspathy to fry 12 cloves, 16 cardamon, 4 inch pieces of cinnamon (Broken to small pieces), till smell of spices come. Add the drained rice and fry till basmathi smell comes. Boil 3 liters of water (12 cups) with 2 teaspoon lime juice and approx 4 tea spoon salt ( 20 gm) add the fried rice and cook till rice is done. Arrange rice and chicken in layers in a vessel.You may add colour by sprinking turmeric solution, Garnish with fried onion and chopped mint leaves.Serve hot and fresh. 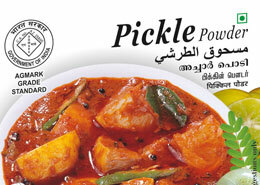 Pickles are important item in practically every Indian meal. Traditional pickle recipes using unique spice mixes and vegetable oils are made with a wide variety of Vegetables. 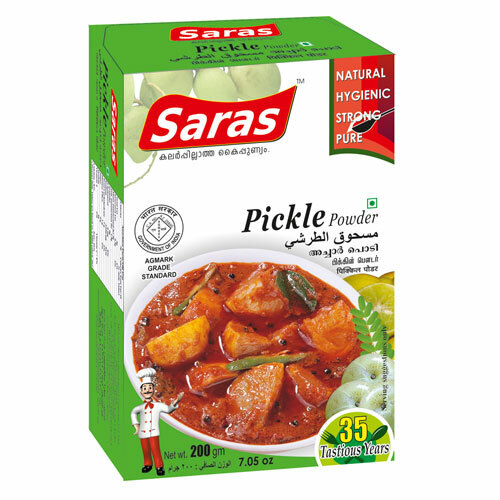 Saras pickle powders are the key to creating delicious, mouthwatering pickles which are the perfect appetizing compliments to your every meal. 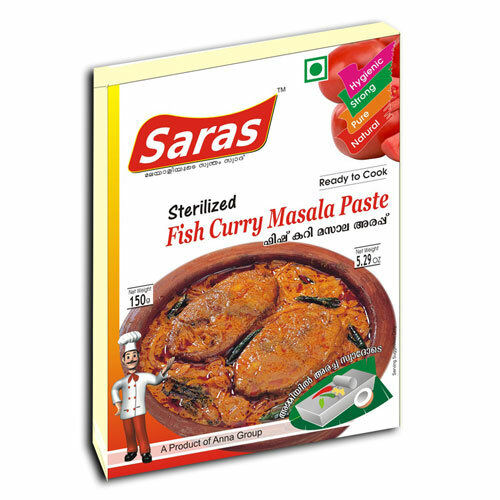 Saras curry powders and masalas are not only delicious, nutritious and safe, but also affordable and highly time saving. SARAS source the spices from the best producers in the country, and later handpick the finest and freshest, with the help of a team of competent spice experts. 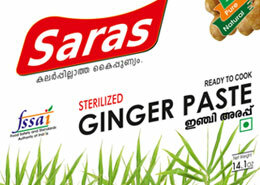 With the state-of-the-art grinding mill and processing plant, SARAS ensures 100% hygiene, quality in production, packaing and shipping.As products are susceptible to bacterial spoilage and poisoning, SARAS uses rigid sterilization methods to destroy micro organisms to prevent re-contamination successfully.SARAS is committed to provide pure organic seasonings & food products that are completely free from artificial preservatives, colours,chemicals, and additives.